Happy New Year!!! We have survived another year. Let's hope this New Year will be better than the last. At the 150th National Grange Convention, buttons were sold reading “I am a DO•er”. This is for those hard working Grange members who work the kitchens, serve the dinners, slave at the fairs, rally the troops, seek the donations, knit the lap robes, crochet the scrubbies, sell the tickets, fix and maintain the halls, clean up the messes that others leave behind and go to the meetings. While at the National Grange Building, which overlooks the White House, we witnessed a new urban farming event on the Grange building rooftop. Bee Hives. They are producing honey from the flower gardens surrounding the Grange building, and will hopefully be selling honey in the next year. Just think, honey from the flowers at the White House. We should all think of ways that agricultural groups can benefit from our halls, Lecturers, meetings, hands on activities, master gardeners, community gardens, commercial kitchens, bee friendly plantings, etc. Look outside of the box for opportunities to get the Grange name out in the public. It is there, you just have to see it. Our State Community Service Committee still has the $150 grant for a new project. You just have to fill out the application. Our membership has shown a decline this past year. This is because some Granges have taken members off the rolls that haven't paid dues or those paying their dues are not doing so anymore. This is to save money that is paid to the State and National Granges. We have taken in a large amount of new members, some Granges by 10 new members. Good work to those Granges and keep up the good work. 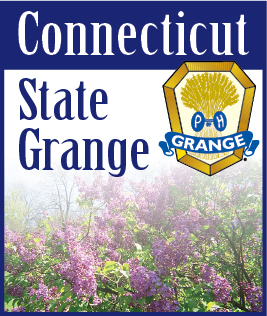 Our State Membership committee is still willing to work with your Grange in a membership drive with free printed materials for you. ALL YOU NEED TO DO IS ASK!! Let’s all work together and reach out to new members.